The athleisure trend reached new heights in 2017 pushing the sports clothing market worth up to £2.5 billion, up 8% on 2016, according to GlobalData. The spike in sport-inspired-fashion has filtered down from the runways. Demna Gvasalia, acclaimed Creative Director of Vetements and his younger brother Guram put sportswear right back on the sartorial map with that Vetements x Champion tracksuit that sashayed down the runway at the Spring ‘16 show. 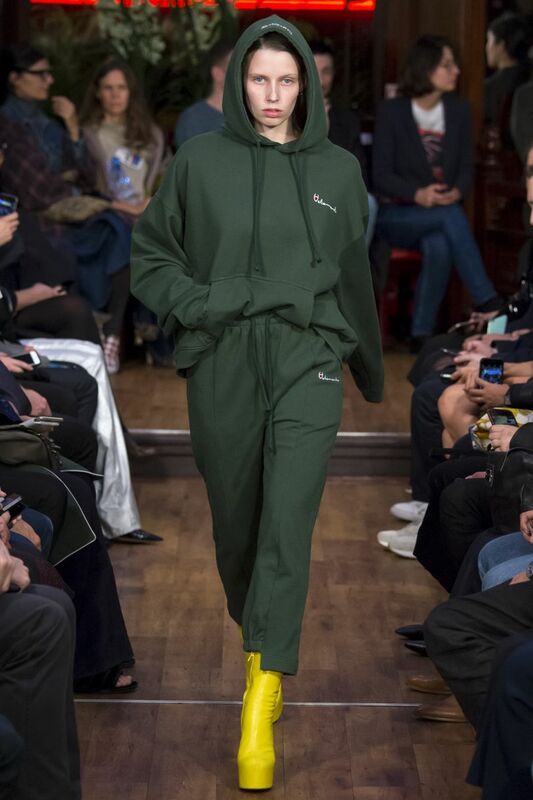 The hype that surrounded that show left us keen to covet Vetements’ effortlessly cool, high-low vibe, even if we couldn’t afford the £640 hoodie, the high street got hit-up and retailers saw the sales of trainers and the humble hoodie soar, with ASOS reporting double-digit growth on tracksuits and hoodies year on year. Sports Direct maintains its position as the leading UK retailer for sports in the UK. However, it can’t live up to the high demand for ‘fashionable sportswear’ and the ability to supply trend-driven styles at record speed like high street giants, ASOS, Topshop and H&M. Every fashionista worth their weight in fugly trainers has been snapped in their athleisure pieces; hoodies layered under a mac/bomber/trench or an oversized puffa hanging nonchalantly off of one shoulder. Vogue coined it the ‘haute hoodie’ …. ‘there’s no telling what the designer can convince the millennial set to buy next.’ The tracksuit was the new power suit. Demna has gone on to sprinkle his sporty aesthetic on Spanish super-brand Balenciaga (where he is also Creative Director). The Balenciaga aw18 show saw men and women taking to the runway at the same time for the first time in the label’s history – clad in multi-layered sportswear. Sportswear has eschewed ‘chav’ status. We’ve charted Supreme’s remarkable rise – From Cult Skate Shop to Fashion Superpower. Last years power-collab with Louis Vuitton saw luxury fashion-house collide with one of the most ‘influential and disruptive labels in the digital age’ – The collection commanded a hell of a lot of attention, hefty price tags and a ‘global shopping stampede’ reported the FT.
From Balenciaga to Christopher ‘Croc’ Kane, Louis Vuitton, and Gucci, in 2018 the trainer reigns supreme. ‘Trainers are now an integral part of every girl’s wardrobe. From high end to the high street to sportswear labels, brands are producing trainers that aren’t made to run in, but instead to be seen in. ’ says Danielle Dondi, buyer for womenswear sports brands at ASOS. When Kanye West teamed up with Adidas to design and launch the Yeezy in 2015 the world went mad. Kanye released just 9000 pairs, available only in New York. They sold out in ten minutes. The brands most recent release the Yeezy 500 Blush ‘Desert’ Rat pre-orders sold out instantly. The Yeezy styles and retail from £90 to way over £1000 a pair. In 2016 Rihanna’s first Fenty x Puma collection sold out in 18-minutes. Global Data’s latest report reveals that the on-going athleisure trend remains pivotal to the growth of the sports market as sportswear makes up over half of the total UK sports market. Athleisure is expected to consistently outperform the overall sports market over the next five years. We have all become more ‘casual’, sports fashion has filtered into every day, it’s acceptable to wear trainers in many workplaces or on a night out. ‘The gender split of sportswear shoppers is narrowing as more women buy into the sector, at ASOS our sports sales are up 20% year on year’ says Danielle. ‘Without a doubt this year it’s all about ‘dad trainers’ and we’ve previewed a few of the options of these coming through from the big brands. Adidas launched their YUNG trainer at Paris fashion week in February, sending them to a selection of influencers to wear out and about. This is one of the exciting styles that we will be selling come June/July. Everyone will want it.’ says Tim.